In June when conditions for observing halos aren’t fine because of low full moon elevation, I have had my best observation ever. On cirrostratus veil divided from cumulonimbus cloud firstly appeared 9° halo and later thick halo at 22-24 area. After stacking 20 pictures, it turned out to be 23° and 24° halo. Fragments of 20° halo were not recognizable until stacking photos. 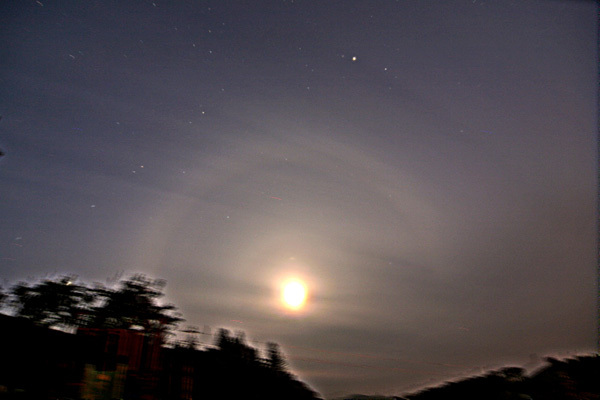 Halos were seen at the highest intensity for about half an hour. This looks to me more like a 22+24. There is little bit of a dark stripe in that broad halo. 22+23 are too close to be separated. What was the date of the halo? In last June, the moon was full at the very beginning and end of the month. pyramidal hal in moon was 25.june.